1. 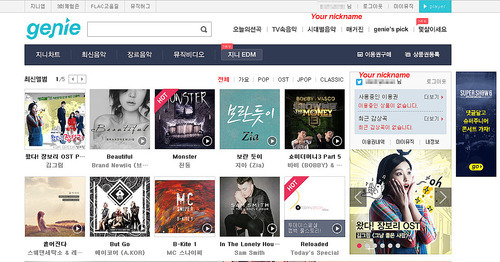 Go to genie.co.kr and look at the small box on the right. 2. Click either one of the options for Facebook, Twitter, or KakaoTalk. 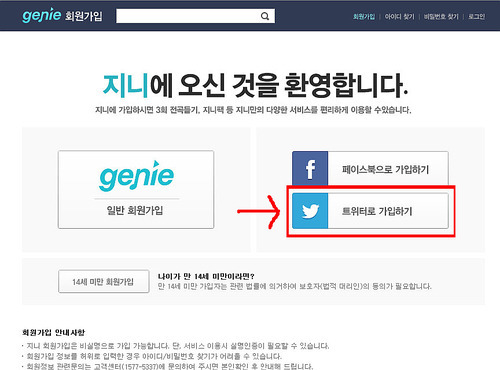 We suggest you use your KakaoTalk account just because Genie no longer accepts new registration with Twitter account. 3. If you are already logged in on your twitter, you will see this page. 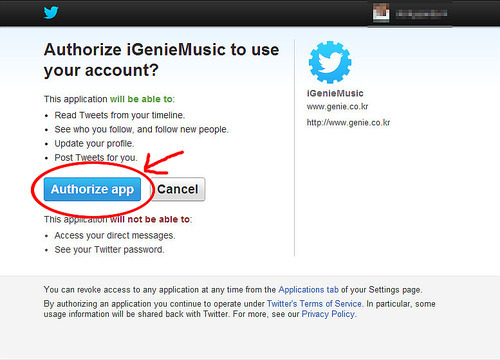 Click “authorize app” to be allowed using your twitter account on Genie. You then will be redirected to Genie’s page. 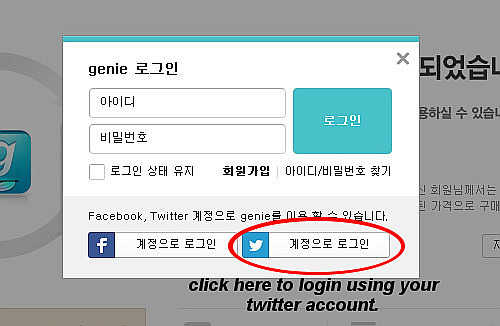 *If you have not logged in on your twitter, it will ask you to login first to your twitter and after you log in, you should be redirected to Genie’s page. 4. Next page is where you start your registration. Click the twitter logo on the right and it will bring you back to the Twitter confirmation page. Again, you have to “authorize app” so that you can use your Twitter account to make account on the site. a) when you click KakaoTalk logo, a pop up will appear and it will ask you to login to your KakaoTalk account using the email you have registered for Kakao. If you have never registered your email before with your KakaoTalk account, click “sign up” at the bottom and you will be brought to page where you can sign up. Everything should be in English. 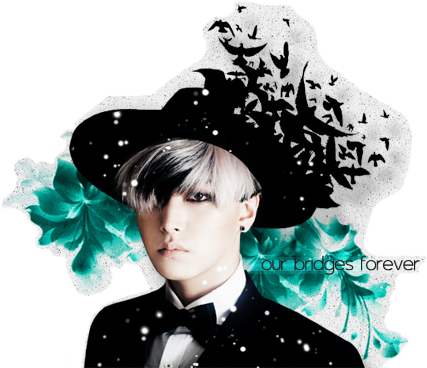 b) Once you login to your account, you will be brought to this page. 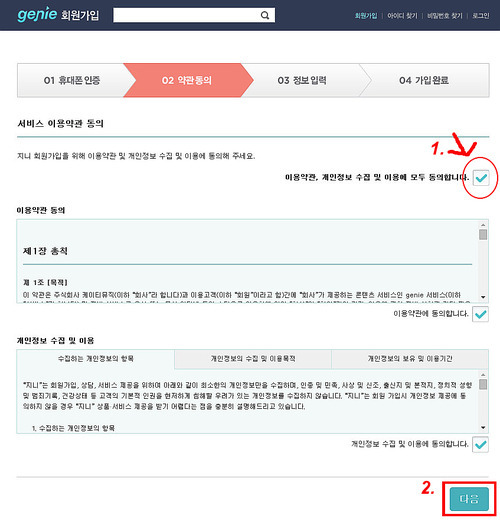 You need to click “agree” in order for you to be able to use your KakaoTalk account to sign up for Genie. 5. You will then be brought to the agreement page. You have to check all of them to be able to go to next page. 1) Click the first box to put check in the rest of the box. 2) Click the button in the bottom to go to next page. 6. You need to make nickname for your account. 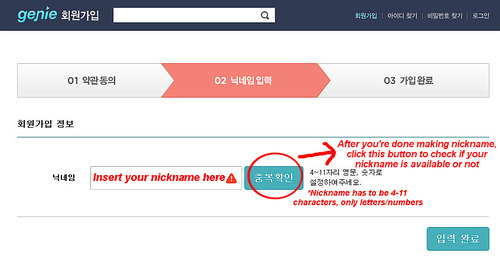 You also need to put down your email that you want to use to sign up in Genie. ++++ The new system now also asks you to register your email when you’re signing up. 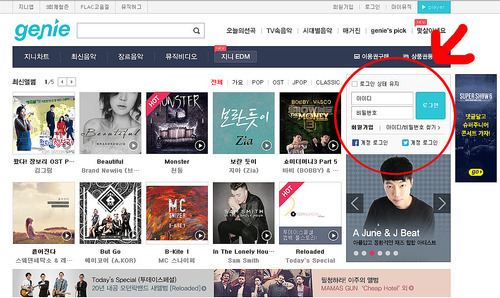 If the page you are having is in Korean, do not worry. Everything is the same with above screencap. Remember, when you put in nickname or email, there has to be a green check beside it. This means your nickname or email is acceptable. When everything is accepted, don’t forget to click “enter” or the button at the bottom. 7. 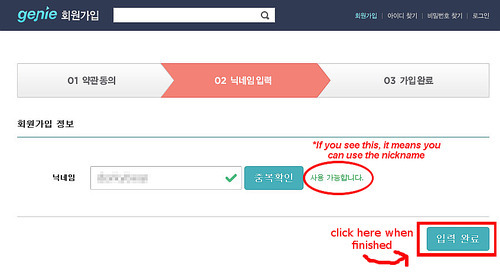 If you see this page after clicking the finish button, it means you have successfully made your account on Genie using your twitter account. Click the button as directed by picture below to login using your twitter again. 8. You will see this box. Click the twitter logo again and it will bring you again to Twitter confirmation page. If you’re using KakaoTalk, click the KakaoTalk logo instead. The steps will be the same as when you sign up, except you won’t be asked to put in your info again. 9. When you’re done, the site should bring you back to the main page and you should be able to see your nickname on the main page, like picture below. 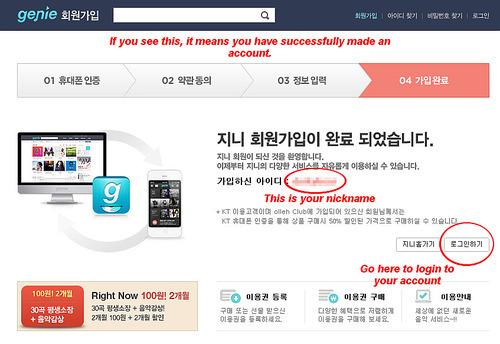 ** You can also use your facebook account to make an account. It should be the same steps as making account using twitter. Hi. Do you have another link for genie app for android users? The link you provided doesnt work for me. I’m from Vietnam. Thank you! Any link for iPhone users? Hi! How do I register from Kakaotalk? Thanks! I can do it! 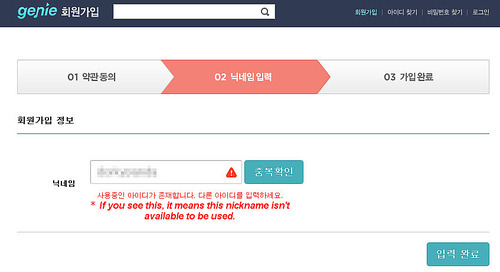 is it still cant make genie account?? ?